Telling your child to hug or kiss a family friend or relative might seem like an innocent thing to do, but as this controversial meme points out, it could actually be giving your kids a dangerous message about the rules of consent. “I am 5,” reads the meme’s message. “My body is my body. Don’t force me to kiss or hug.” It was posted on A Might Girl’s Facebook page alongside excerpts from an article titled “I don’t own my child’s body,” written by CNN writer and producer Katia Hetter. 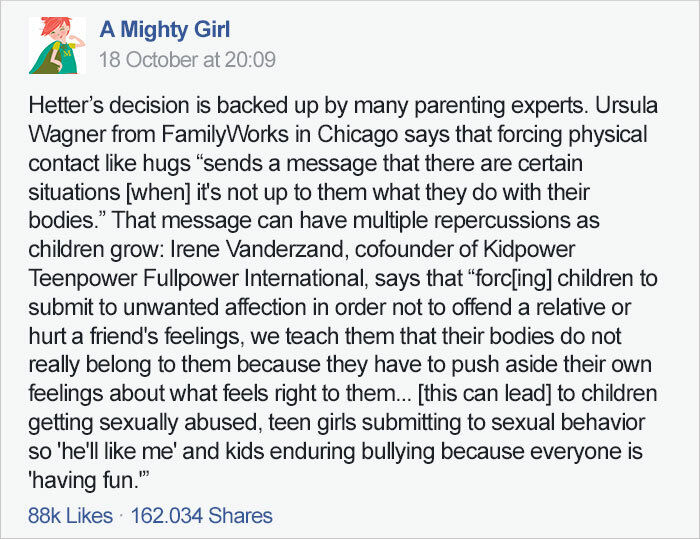 In it she argues that encouraging children to submit to unwanted affection is actually teaching them that their bodies do not belong to them, and that forcing them to touch people they don’t want to could actually leave them vulnerable to sexual abusers. The post has since been liked more than 88k times and shared by over 162k people. It’s also started a dialogue on what parents should and shouldn’t be teaching their children. What do you think? Let us know in the comments below.